Sarasota News Leader May 24, 2013 OPINION Page 64 When we consider which commissioners might be most likely to put aside personal prejudices or self-interests in considering actions for the good of the city, we think first of Shaw and Chapman. 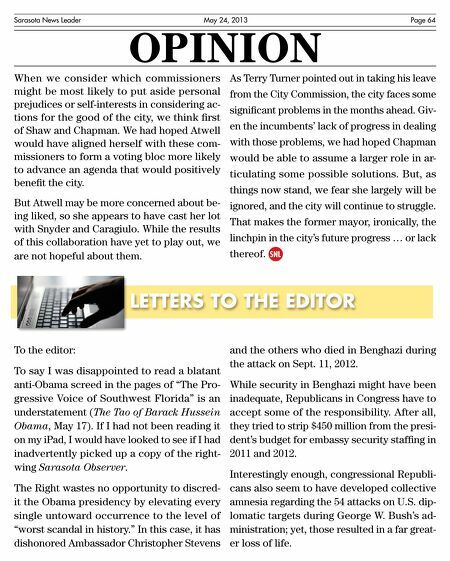 We had hoped Atwell would have aligned herself with these commissioners to form a voting bloc more likely to advance an agenda that would positively benefit the city. As Terry Turner pointed out in taking his leave But Atwell may be more concerned about being liked, so she appears to have cast her lot with Snyder and Caragiulo. While the results of this collaboration have yet to play out, we are not hopeful about them. ignored, and the city will continue to struggle. from the City Commission, the city faces some significant problems in the months ahead. Given the incumbents' lack of progress in dealing with those problems, we had hoped Chapman would be able to assume a larger role in articulating some possible solutions. But, as things now stand, we fear she largely will be That makes the former mayor, ironically, the linchpin in the city's future progress … or lack thereof. % LETTERS TO THE EDITOR To the editor: To say I was disappointed to read a blatant anti-Obama screed in the pages of "The Progressive Voice of Southwest Florida" is an understatement (The Tao of Barack Hussein Obama, May 17). If I had not been reading it on my iPad, I would have looked to see if I had inadvertently picked up a copy of the rightwing Sarasota Observer. The Right wastes no opportunity to discredit the Obama presidency by elevating every single untoward occurrence to the level of "worst scandal in history." In this case, it has dishonored Ambassador Christopher Stevens and the others who died in Benghazi during the attack on Sept. 11, 2012. While security in Benghazi might have been inadequate, Republicans in Congress have to accept some of the responsibility. After all, they tried to strip $450 million from the president's budget for embassy security staffing in 2011 and 2012. Interestingly enough, congressional Republicans also seem to have developed collective amnesia regarding the 54 attacks on U.S. diplomatic targets during George W. Bush's administration; yet, those resulted in a far greater loss of life.